Pudsey Bear pays us a visit! 20th anniversary party with Filbert Fox. Georgia Burgess from X-Factor calls in to say hi! Oh, I see! How lovely! The Voice of Glebelands Winners! A big thank you goes to the school's PTA for organising this year's 'Sweetie Bingo' event. Over a hundred children got their ‘eyes down’ and enjoyed the after school event. 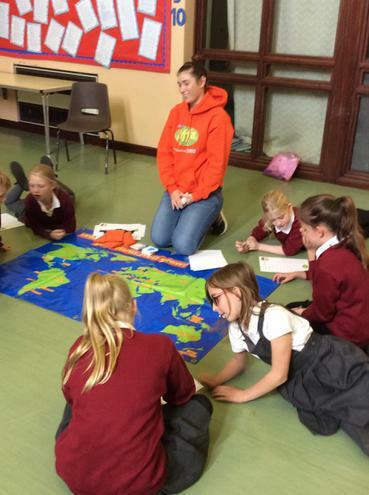 A group of Year 5 children attended the Cedars Academy as part of our joint collaboration programme. The theme of the visit was ‘Samba Carnival’, whereby the children were taught to play a range of instruments followed by a performance to students at the school. The children thoroughly enjoyed the experience and I would like to thank Mr. Scrivens, their music teacher, for looking after us and for making the trip so much fun. This month we welcomed Sarah Weldon who spoke to our Year 5&6 children. Sarah’s career has seen her work with the Royal Navy and on film productions such as James Bond and Harry Potter, and research posts in the Arctic, Amazon, desert, and more recently with the Ministry of Education and Science in the former Soviet Republic of Georgia. Her hour long presentation was impressive to say the least. Our girls have certainly been inspired to think about careers which they didn’t even know were out there, and I for one am looking forward to seeing our school leavers receiving their Nobel Prizes for maths and science! What a fun start to 2018! The term got off to a 'Rocky' start when the Rock Steady Band came to Glebelands to demostrate their skills on the drums, keyboard and electric guitar. Children in the audience were treated to a number of favourite tunes and inspired to take on a new skill. Rock Band tuition will commence later this term so watch out Harry Styles - here comes Glebelands! Our Foundation children were given the opportunity to prepare for riding on two wheels when Nicola from Sustrans brought in a number of balance bikes for children to ride. Each group was given a tricky course to navigate and I am pleased to say that all children passed with flying colours. Finally, Mrs. Sudra brought a taste of Asia to the school when a number of classes got involved in making and tasting traditional Indian cuisine. Our Year 5/6 children are currently working on a Hollywood/Bollywood topic which sees them exploring the differences between Western and Eastern cultures. 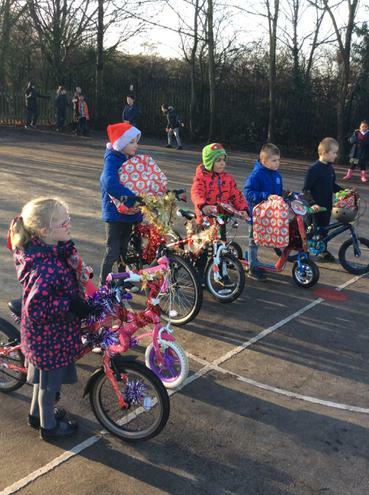 Here we see a number of children who have received their prizes as part of the 'Bling your Bike for Christmas' competition. Nichola from Sustrans judged the bikes which were very blingy indeed. Well done boys and girls! Santa's on his way!! 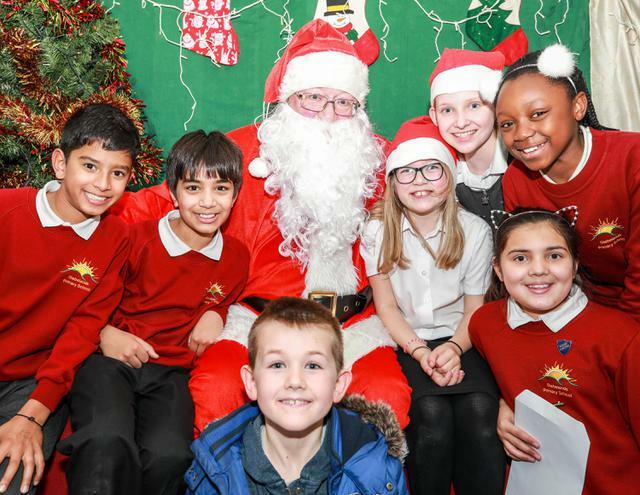 Thank you Santa for paying us a visit at the PTA Christmas fair this year. I am sure all of these boys and girls will be on your 'Nice' list. A big thank you to all those parents and staff who supported the Glebelands 'Big Dig'. Here you can see a number of individuals with Mrs. Anderson and Mrs. Hobson clearing the overgrown branches and bushes in the wildlife area. 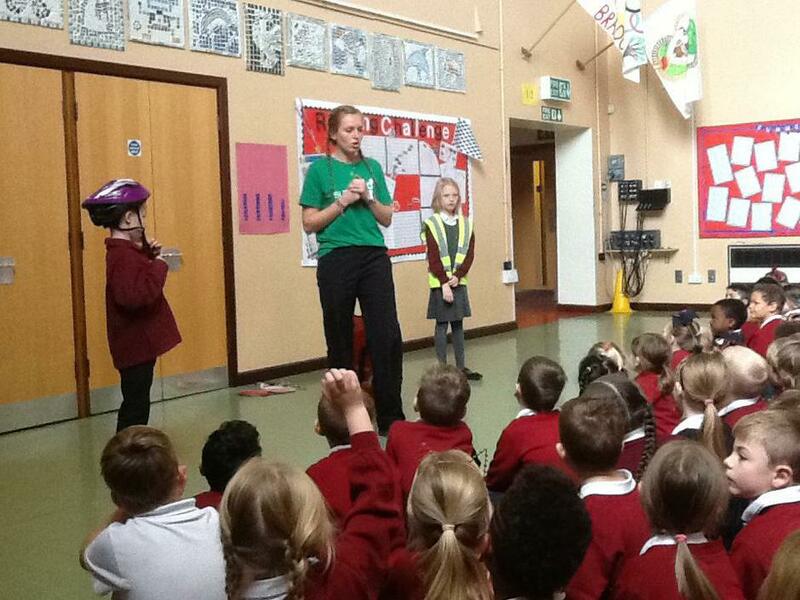 Nichola from Sustrans is telling the children about the importance of exercise and healthy living. Nichola also launched the 'Dr. Bike' sessions whereby children and parents could bring their bikes in to have them repaired - for free! 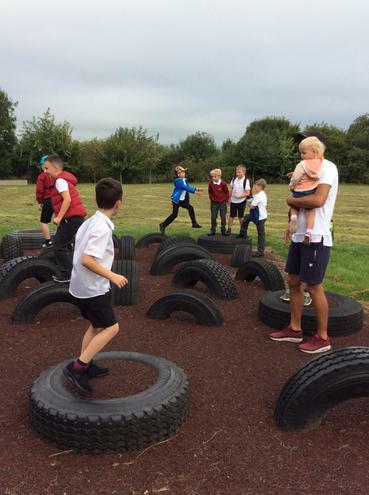 You can also see Alex working with some of our children through his role as lunchtime play leader. The children now have the opportunity to play in structured games during lunchtimes. Finally, we sent some of our old school chairs to a primary school in Zambia. Mrs. Watts, who organised the transportation, assures us that the furniture was gratefully received - as you can see from the photo! Wow - What a busy month!! The year 5/6 residential to Castleton was a huge success and enjoyed by all. Here we see some pupils taking part in a Roman battle and using their shields in 'testudo' (tortoise) formation. Ms. Alvey took advantage of a warm, sunny day and decided to take her science lesson outdoors. The children took part in a mini-beast investigation and got their fingers wet and slimy - no creatures were harmed during their investigation! Representatives from Jaffa Juniors did a wonderful job informing the children about oranges and the benefits of eating healthily. Everyone was given an orange at the end of each session to tuck into. Thanks Jaffa! Finally, our Alumnii from the Cedars Academy have been supporting children in class as part of a work-experience collaboration between our schools. I have no idea what was said to Emily Maw in Foundation, but she seems to be enjoying a good joke! 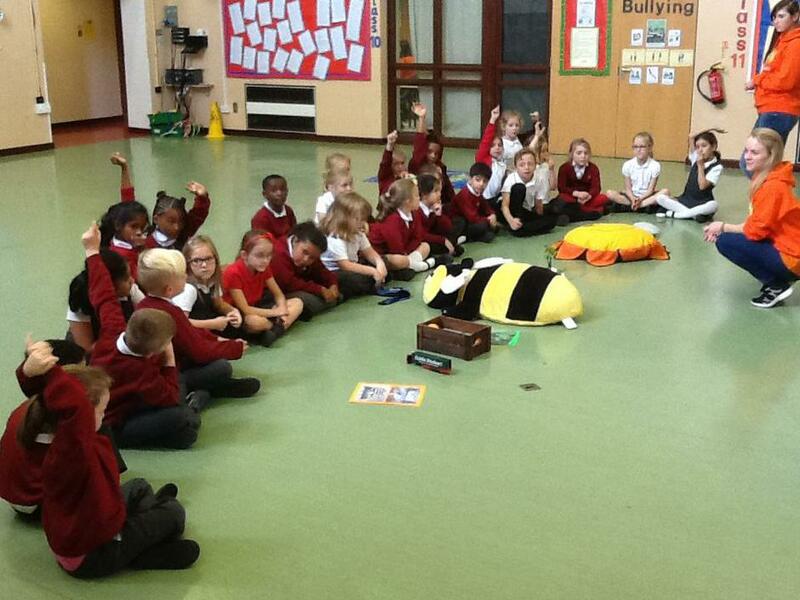 As you can see the children were bursting with energy with which to begin the new term. It was great to all of our children sparkling fresh with new uniforms and raring to go! 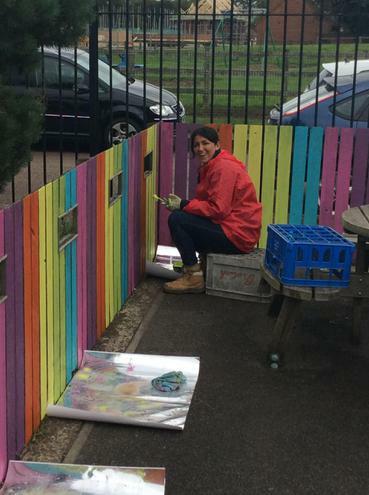 We also had a visit from a number of volunteers from Santander who had travelled far and wide to give our Foundation fence a lick of paint. 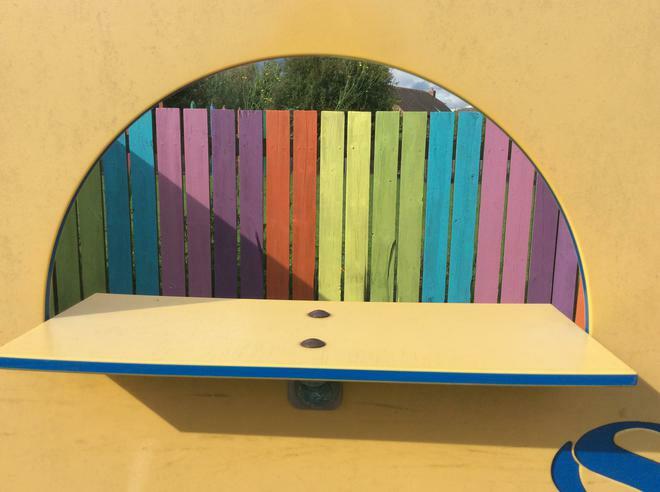 Santander donated £250 worth of materials to brighten up the school and we look forward to seeing them again in the not too distant future. Finally, as part of the Year 3/4 topic on Africa, the children enjoyed taking part in a workshop teaching them the art of African drumming. A wonderful performance was given to parents at the end of the school day, and if you look at the young lady in the foreground - the noise level nearly took the roof off! Well done boys and girls! Sadly we said goodbye to our Year 6 children who have been wonderful ambassadors for the school. Here you can see several of the children visiting the Space centre when they were in Year 3. How the time flies. Good luck to all of you! 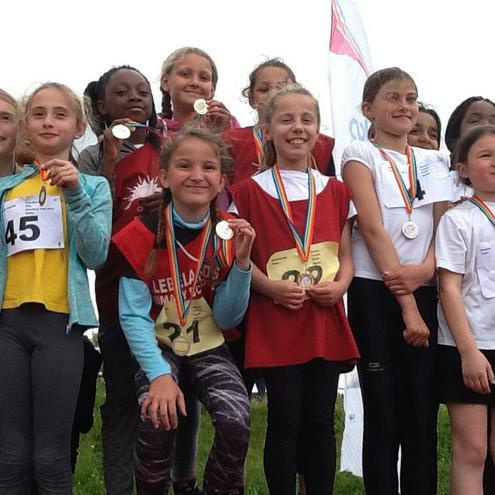 More success for Glebelands! Our Year 5 relay team finished in gold medal position as Saffron Lane. This was a wonderful achievement and to say the crowd went wild would be an understatement. Very well done girls, you made us all so proud. The NSPCC paid us a visit to promote safety and wellbeing when out and about. Timmy the puppet reminded our KS1 children of the importance of crossing the road safely as well as touching on the topic of stranger danger. Our TAG rugby team were fabulous ambassadors for the school during their 9 game tournament at Kirby Muxloe. Having won 6 of their games our teams finished well. Despite being a non-competitive event, I would certainly have given both teams first place! Finally, June saw our Year 5/6 children put on a memorable performance of 'An Inspector Calls', While this was not the JB priestly classic, we all agreed that it was even better. The audience were spellbound and the depiction of Mr. Lee was spot on - although not nearly as handsome! My, My! The new term got off to a cracking start. Our Eco-Committee achieved Silver accreditation for all of their hard work in trying to reduce the amount of power which the school uses during ' down time'. Monitors have been turned off, children have been reminded to switch off the lights and teachers have been graded for their eco-friendly attitudes. 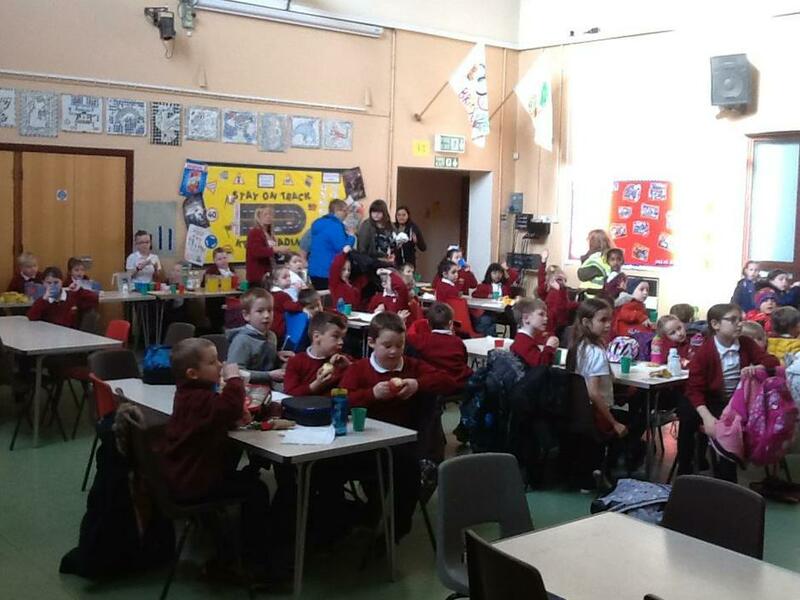 May also saw our School Nutrition Action Group (SNAG) promote healthy eating across the school - particularly with regards to children's packed lunches. Here you can see Mr. Kitchener sharing the message in assembly. Our Gardening Club are doing a wonderful job in keeping the school weed free and tending to their salad and vegetables. With the glorious weather we have been having, it won't be long until they are chomping down on a tasty salad bowl! Finally, a number of children attended a presentation event at City Hall to receive their certificates for taking part in a poster competition to promote recycling. One of our Year 3 children won 3rd place in the city-wide competition. Well done to all of you! April brought us only two short weeks at school. Here we have just a few examples of the wonderful Easter bonnets the children created to celebrate the coming of Spring. Some wonderful designs, I am sure you will agree. 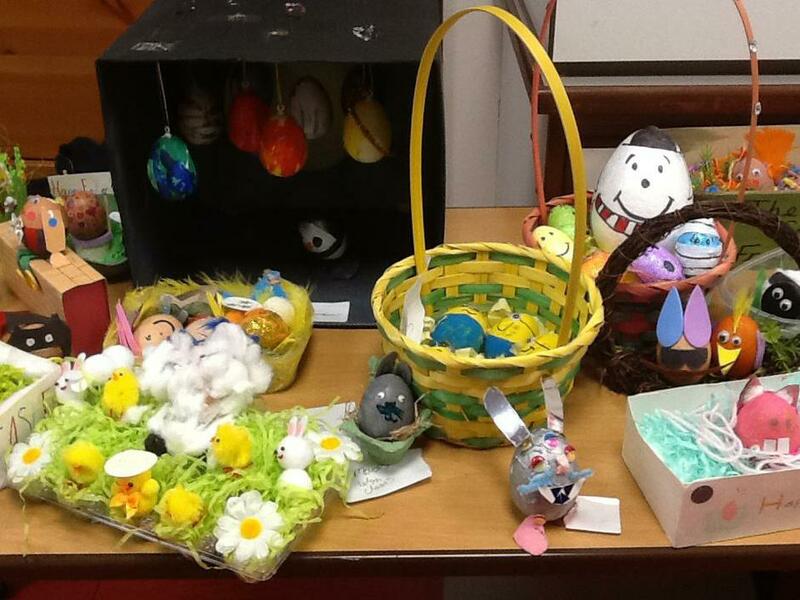 Our children also had the opportunity to work collaboratively on Easter Egg designs as part of a class swap activity. 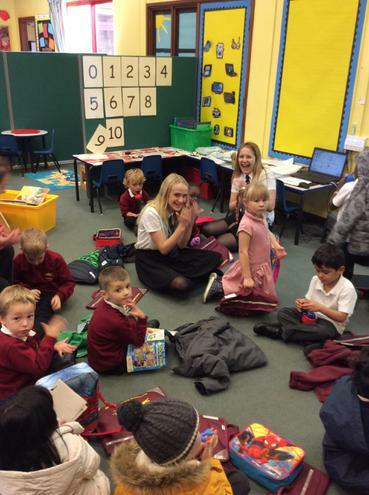 Some of our older children did a great job acting as perfect role models for the younger ones to follow. Well done! Here we have our Alumni paying us a visit to present an assembly on their achievements and talk about their goals for the future. 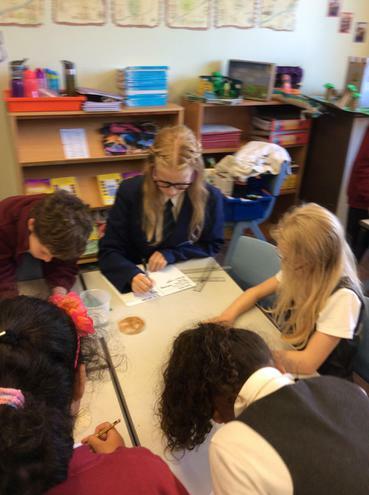 The event was well received by our children, which was then followed up by a number of Year 6 groups being supported with their maths and English work. 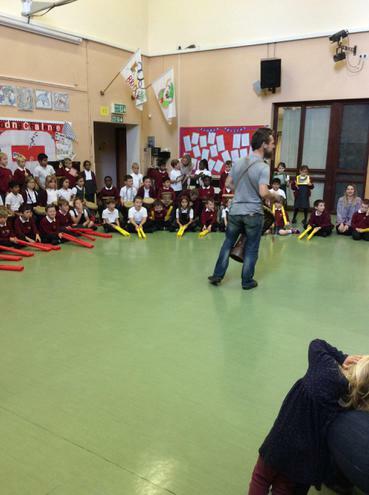 The Year 3/4 and 5/6 mixed hockey teams had a great deal to celebrate. Both teams won their respective tournaments which took place at St. Margaret’s Pastures sports grounds on Friday 31st March. Despite a shaky start to the day when the minibus failed to turn up, the children rose to the occasion and were crowned champions of Leicester West. Both teams will now go through to the Summer Championships which will take place in June. Billy Branstone's Amazing Potato Bus paid us a visit. Throughout the week, our children were given the opportunity to plant, grow and cook the versatile vegetable and sample the delights of potato cuisine. Thanks to Billy Branstone for choosing Glebelands! Great to see the Author's Chair being used to celebrate outstanding pieces of writing. Our budding authors are given the opportunity to share their work and answer questions about their compositions. Watch out Julia Donaldson, you have some competition! Mr. Kitchener's class invited parents in to celebrate the end of their topic on Mexico. The children exhibited the broad range of fabulous work which they had created over the term. Some samples of pre-prepared spicy salsa was also made available. Aie Caramba! 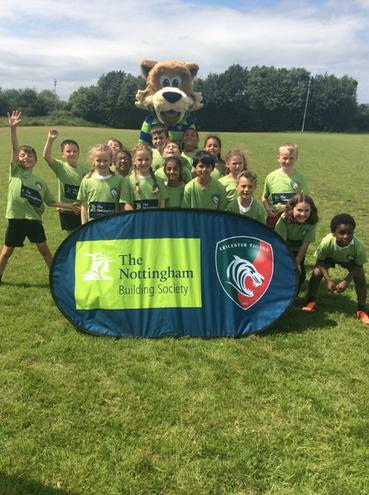 And finally, our Year 3 children visited Welford Road as part of Leicester's Author Week at Welford Road. 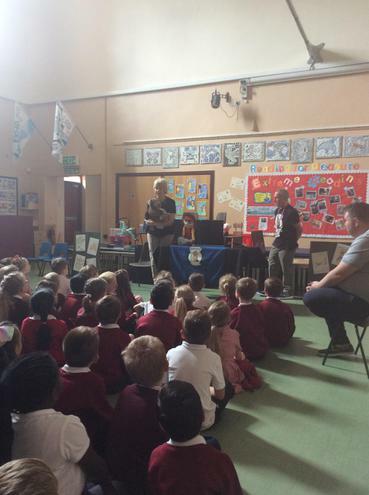 The children were given the opportunity to be entertained and inspired by 'The two Steves', who gave them some hints and tips on how to become even better story writers. the children were also given a free book to take home and read. Well done for being such great ambassadors for Glebelands. Class 11 visited the New Walk Museum and Art Gallery as part of a Literacy and Art collaboration with the Mighty Creatives. The children explored a range of artistic pieces which will feature in their writing compositions. 'Jupiter Jack' from Mad Science paid us a visit to demonstrate to the children the kind of activities which they can expect during his after-school club. The children took part in a number of fun demonstrations involving water whirlwinds and a smoke vortex. Finally, our lunchtime DT club has been a popular activity. The children have been investigating bridges and load bearing structures. As you can see, masking tape was at a premium! Here you can see Year 5/6 football team receiving their first piece of silverware of the season. Congratulations for coming top of the division with an unbeaten record. We wish you all the best in the next round of the competition. Our Christmas performances were a resounding success. The children in Foundation and Key Stage 1 brought plenty of smiles (and a few tears) to our parents' faces. Well done! The school was extremely fortunate to be chosen to host a visit from Leicester City FC representatives who brought along the Premier League trophy. Each class had the opportunity to have their photograph taken with the prestigious trophy, as well as ask a range of questions about it. Our Year 3/4 children visited Bennion Pools on a rather wet day to plant bulbs at the park ready for bloom in the spring. 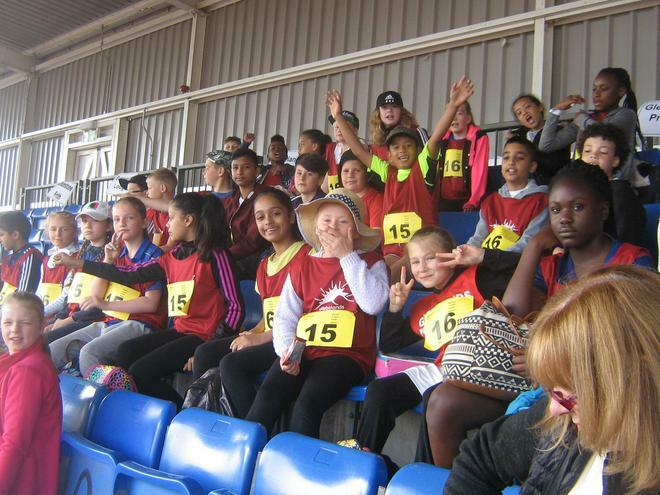 The organisers commented on our children's enthusiasm and perfect behaviour. Well done. Let's Get Cooking Club got underway with several of our children making jars of delicious jam. Yum! October saw the first of three cross country meetings at Prestwold Hall. The sun was shining and the meeting was very well attended. We also had a number of children finish in the top 30 which is the best start to our season ever! 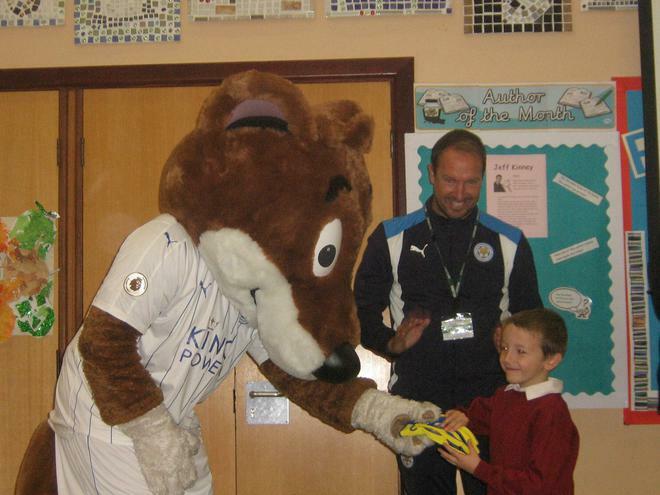 Filbert Fox paid us a visit to present a prize to our school's winning Summer Reading Champion. Filbert also thanked our Foundation children for all of their hard work during their Leicester City Football Coaching sessions. Well done boys and girls. 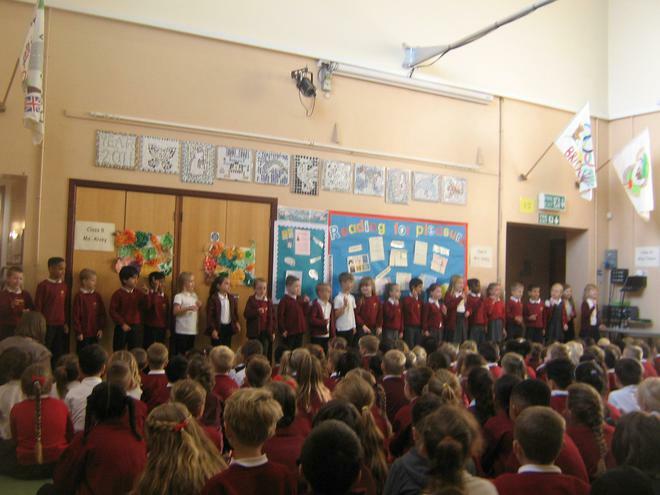 National Poetry Week culminated in each class reciting a poem which they had been learning throughout the week. Each poem was judged by our Chair of Governors and prizes were awarded to the winning class. Here's to next year! The whole school celebrated Roald Dahl's 100th birthday by dressing up as our favourite characters. Lots of imaginative costumes were modelled with prizes presented for the best costume from each base. Several of our previous pupils who now attend The Cedars made a surprise visit. We were all amazed at how grown up they look in their blazers and ties! To launch the Year 5/6 Asia topic, several musicians from the Confucius Centre in Leicester played some of their traditional instruments, As you can see, the children were spellbound. The whole-school sponsored walk was a resounding success with some of our older children heading to Rothley Primary School. There were lots of very tired and aching feet when the children returned to school. Our Year 4 Quick Sticks hockey team collected a bronze medal in the Leicestershire and Rutland School Games. 72 teams took part in 14 sporting events at Welbeck Defence College. Our hockey team played 9 other area winners (who all offered some very stiff competition) and did exceptionally well to achieve a medal. It wouldn’t be the end of term without a fine performance from Angela Parkes’ theatre group. This term saw “Social-Ella” hit the stage with not one, but three ugly sisters! We also said farewell to Mr. Bailey and his djembe drums with a super performance by our Year 4 and 5 drummers. 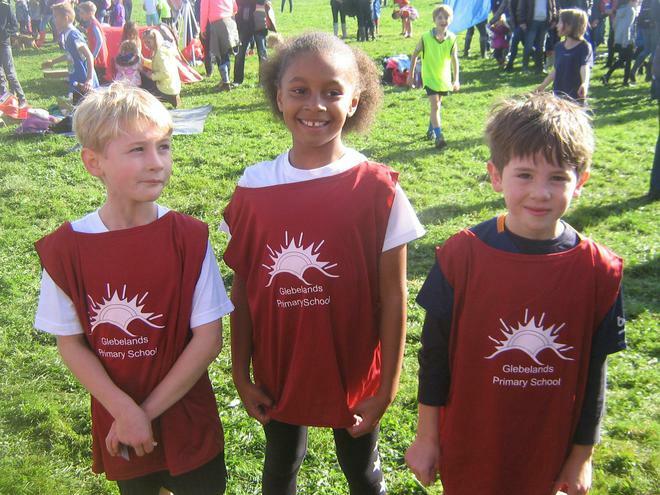 The sun shone at Saffron Lane and a number of medals were won. A track record for the girl's 75m was also set by one of our Year 6 pupils! 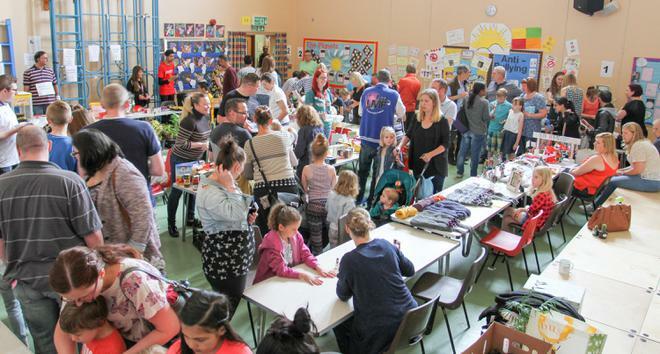 This year's summer fete was well attended despite being mostly indoors (again). Our Foundation children performed a number of acts to help support our wonderful PTA's annual fundraiser. June also saw a number of our budding artists head into the City to work with an artist who arrived in Leicester as a refugee. The workshop formed a part of our School of Sanctuary award and the finished piece can be seen in the school's entrance. This month saw a visit to Glebelands from a class of Year 5 children from Charnwood Primary School who presented their Eid assembly. The performance was hugely entertaining and was followed up by a range of sporting activities on the school field. The 13th annual arts concert took place with children performing a number of acts ranging from instrumental pieces to dancing and singing extravaganzas. The evening was well attended with the children's hard work certainly paying off. Well done boys and girls! 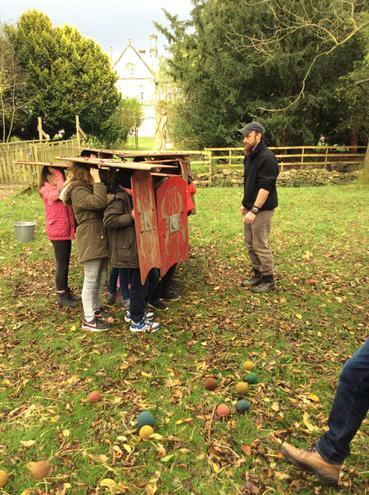 The Beaumanor Hall residential trip saw the children engaged in lots of exciting activities over the three days. Here the children are heading for super heights up the climbing wall! Danny Drinkwater received a match report from one of our children. As you can see, he is totally engrossed in the report and, as a reward, sent a number of signed photos. These may be worth a penny or two in the future! Several of our children also appeared in the Mercury having sent letters to a young refugee who had saved the lives of others. Well done boys and girls! This year's inter-house sports festival saw Western win overall in KS2 with Abbey securing a win in KS1. All KS1 children visited Battram Woods as part of an outdoor learning experience designed to inform and engage children in their learning about their local woodlands. Lower Key Stage 2 children were inspired and entertained by a number of authors at Welford Road which formed a part of the City's Author Week. Our Year 4 hockey team came home with the winner's trophy at the recent School's Quick Sticks Hockey Tournament. Well done! Glebelands was wowed by a visit from the RAF who landed their helicopter on the school field. Children were given the opportunity to don a helmet and sit in the pilot's seat. Inspiring to say the least! Mad Maths Friday provided a whole of day of exciting and engaging activities in which children developed their mathematical skills in a fun and lively fashion. Finally, our Year 1s and 2s took part in Leicester City's Schools Sports competition. Not a bad way to finish the half term! Well, what a busy start to the new year! The children arrived back to school in fine form. Despite the grey and damp conditions, our Year 5s and 6s are ready to face the challenges which the new year will throw at them. Our football team took part in the Leicester City School's Football tournament and came a credible third in their division. The event took place at Leicester City's training ground with several up and coming academy players giving a Q & A session for the children. Our Djembe drummers gave a fine performance demonstrating the skills which they had been practicing during the autumn term. And finally, Liz Kendall, MP for Leicester North, visited our school to celebrate our Teddies for Charity event. The children collected over 250 teddies which forms part of our School of Sanctuary initiative. Well done all! A representative from the Red Cross arrived at school to collect four boxes packed full of donations for refugees living in Leicester. We also had a journalist from the Leicester Mercury come in to school to interview Mrs. Sinhal and several of our pupils about our charity drive. 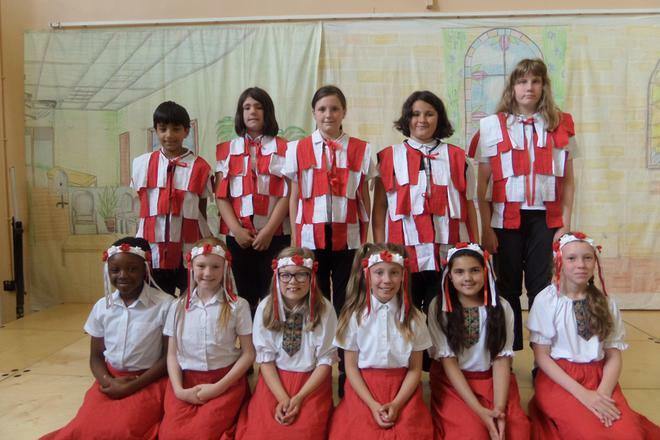 Our KS1 children performed four outstanding shows and entertained parents and pupils alike. In doing so they created lots of festive cheer as we neared the end of term. 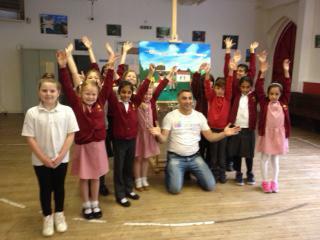 Several of our Year 5s visited the Cedars Academy to take part in an Art and DT day. Throughout the day they made lots of wonderful things which included artistic stained glass window displays to keyings in woodwork. All of the children agreed that it was a fantastic day. We had lots of parents come to visit us during our open day. They helped the children to create Christmas decorations as well as taking part in the a spot of fundraising for the PTA. Filbert Fox from Leicester City came to visit our Foundation children and thanked them for being so brilliantly behaved and during their football coaching sessions. Finally, the Birstall Post came to do a piece on our efforts to support Refugees within the city. We are hoping our contributions will help to achieve a School of Sanctuary award. Lots of exciting things have been happening during October. Leicestershire's PROTECT Team paid a visit to Upper Key Stage 2 to inform them about keeping safe at home and when out an about. The whole team was very entertaining and the interactive sessions meant the children had great fun. Having undergone extrensive training, our Peer Mediators commenced their duties to help resolve any lunchtime disputes. The School Council launched their Operation Christmas Child charity collection which was supervised by Mrs. Watts. And finally, our Year 5/6 children visited Castleton in Derbyshire for this year's residential trip. Despite being a touch on the wet side, all children had a great time and returned as exhausted as ever! The pictures below show a number of events which have occurred throughout September (and early October). We have been investing a lot of time ensuring our children remain safe when crossing roads. Our two Road Safety Officers met with representatives the Local Authority's Road Safety team. We were also joined by the Theatre in Education group who performed a show promoting road safety for our KS1 and Year 3 childen. 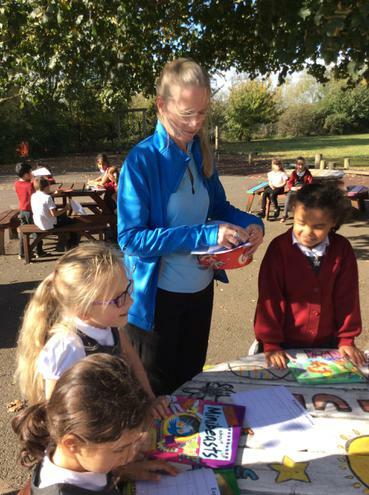 Our whole-school cross country event was a great succuss and you will also see our lunchtime supervirors working with our children who are peer mediators. Their work aims is to provide children with a holistic approach to resolving conflict in school. The pictures below are of a tree planting ceremony that took place on 17th June. The tree has been planted in the Foundation field where it will give shade to the children. It was presented to the school by the Green Belt Movement, an environmental organisation set up by Nobel peace prize winner Wangari Maathai. We were honoured to welcome her daughter to the school to lead the ceremony. She told assembled staff and children that in our lifetime it takes ten trees to provide us with the oxygen we need to breathe, so they are urging everyone to plant ten trees. To find out more, visit www.greenbeltmovement.org . Each month we will be publishing photographs of things that have been happening at Glebelands.